Feed the Good! – Digital marketing with Christy! Pedigree designed a campaign including multiple use of marketing sources. The company first creates an ad promoting the concept and reason for the campaign. It’s posted on Youtube, the Pedigree official website as well as Facebook page to catch public’ eyes. Pedigree continues to keep public’s attention on the campaign by spreading on multiple channels that may contact customers. The ad starts with two young men on the corner of a street, aggressively confronting each other. But then both of them stop when they see a dog wanders in the middle of a busy road, with it’s distressed owner looking on it. The ad aims to show that ‘dogs bring out the good self in ourselves,’ and hence make donations to PetRescue to help our little guardian angels. Now the questions is where we can give in this $2? Here’s a little bit about the campaign. 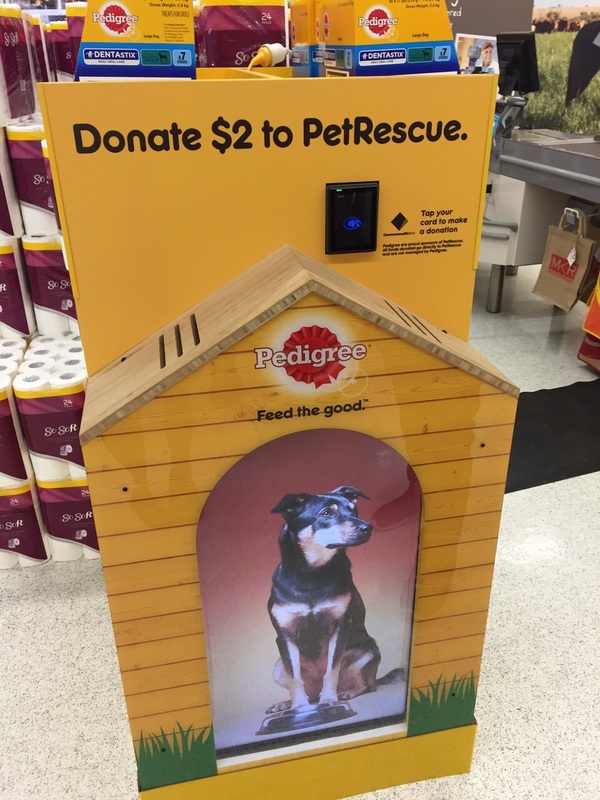 It is inspired by Pedigree’s vision to feed 100 million dogs globally and in the first digital experience of its kind, debuts interactive activation that encourage consumers to make a $2 contactless payment donation directly to PetRescue. The Pedigree Feed the Good campaign kicked off with an emotive 30-second TVC and the full campaign will be live with a further six shopping centre digital experiences, and 50 Coles in-store experiences in locations across the country. The combination with technology is brilliant which enhance the entire experience. In fact, what really first got my attention was the Paypass pad on the stall. I first saw it when I was doing grocery at Coles and I thought there was no way that I should get paid before going to the check out counter. The use of technology enhance the process that customers could be hesitate to take action to donate. With traditional donation, customers have to make up their mind, go to the physical location or online site or app to make a donation. During any time of this process, customers could back out since they have to contribute effort in terms of money and time, but cannot feel something in return. The campaign is designed to make more interaction with consumers so in that way consumers feel they do receive something but not merely give away. The donations result in the on-screen dog being fed, illustrating the direct impact these funds will have on feeding dogs around Australia. All the interactions contribute to the value of the $2 consumers donate.